Terrorist groups in the Southern province of Dara’a demanded reintroduction of the reconciliation plan after the Syrian Army troops managed to advance against them in several flanks on Saturday. The army men, supported by the artillery and missile units, carried out heavy attacks on terrorists’ strongholds from the three flanks of the village of al-Bustan, Harran Air Defense Base and Sama al-Hanidat region in Northeastern Dara’a. The army men managed to drive terrorists out of Deir Dama and al-Bustan settlements in al-Lajah region in Northeastern Dara’a and cut off militants’ supplying lines. In the meantime, local sources reported that the army’s rapid advances in Dara’a province caused the terrorist groups to lay down their arms in the villages and towns of al-Lajah region and agree to the army’s terms and conditions, calling for implementation of reconciliation plan. Meanwhile, the army’s helicopters dropped thousands of leaflets in the towns of al-Harrah, Aqraba and Kafr Shams in Dara’a province, calling on terrorists to hand over their weapons and surrender to the army men. On Thursday night, the army’s artillery and missile units launched very heavy attacks on terrorists’ strongholds in Northeastern Dara’a to introduce the preliminary phase of a major operation in the Southern part of the country. Using a variety of artillery shells and surface-to-surface missiles, the army unleashed a relentless assault last night that targeted the positions of Tahrir al-Sham Hay’at (the Levant Liberation Board or the Al-Nusra Front) in al-Lajah region. The army could score several direct hits against the terrorists, resulting in a series of powerful explosions that could be heard from a long distance away. 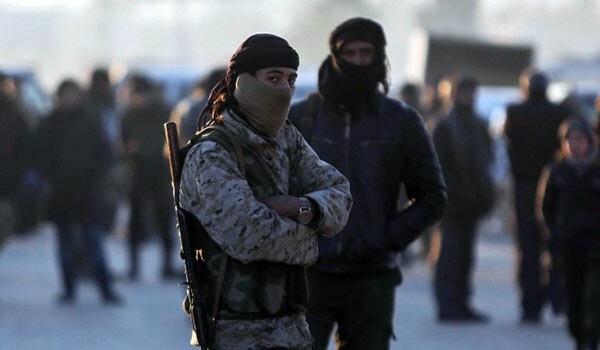 According to a military source at the government stronghold of Izra’a, the army launched more than 30 missiles towards the terrorist-held towns of Busra Al-Sham, Busra Al-Harir, and Al-Karak.